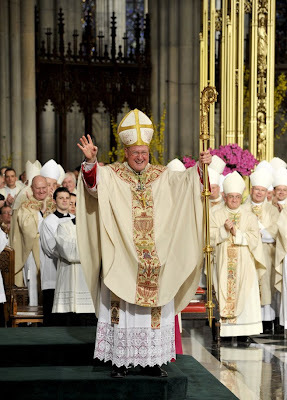 It was a big week for "the Apple;" opening home games for both the Mets and the Yankees in their pristine new stadiums, while a former Milwaukee Brewer's fan made a little quiet history himself...he became the 10th Archbishop of New York. In the event he is not familiar to you, there he is, beaming, arms joyful and outstretched, eager and ready to embrace his new flock. He took the helm as the shepherd of the diocese of New York's 2.5 million Catholics during an elaborate Mass of Installation Wednesday at St. Patrick's Cathedral. The ever ebullient Archbishop claims he is a meat and potatoes man; Jovial, charismatic, with a quick smile and easy going manner, he has been out and about his first days on the job serving meals at a local soup kitchen and conversing with women at a prison facility. Spurred on by an infectious enthusiasm, it is obvious he is a hand's on people person. Many of the more than 4 million Catholics within the five boroughs, (that figure includes Brooklyn and Queens, as they are not part of the New York Archdiocese) and over 65 million nationwide may have a chance to visit Manhattan at some point and might like to see and perhaps meet our new Archbishop. He calls St. Patrick's Cathedral home and you can see him every Sunday as he presides at the 10:15 Mass. Just as St. Peter's represents Catholicism to the world, St. Patrick's is the home Church of all American Catholics. The Neo Gothic Cathedral by James Renwick Jr. is not just one of Fifth Avenues most visited historic landmarks, it is an active parish serving those who live and work in midtown with a full schedule of daily Masses. So, when you stop in to stroll the arched naves and snap pictures of the extraordinary interior, brilliant stain glass windows and sculptures that appear ready to share their stories; stay for a midday Mass or pause to sit quietly a moment surrounded by breathtaking stain glass in the secluded Lady Chapel. Walk to the back of the Cathedral (the apse) just behind the high altar facing Madison Avenue to find this tiny exquisite Chapel. Daily Mass Schedule: Monday - Friday 7, 7:30, 8, 12, 12:30, 1 and 5:30. Saturday 8 AM, 12 Noon and 5:30. Sunday 7, 8, 9, 10:15, 12, 1, 4 (Spanish) and 5:30. Warm wishes to our new Archbishop. P.S. On the baseball front, the Amazin's have one up on the Yankees. They already laid claims to Archbishop Dolan (perhaps hoping for divine intervention) they presented him with his own jersey... Dolan 10. • Compact – fits in a jacket pocket, briefcase, or the slimmest purse. • Easy to read – with step-by-step directions to over 400 locations by subway, bus or train. • Time and Money Saver – have hours of operation, cost and admission information a glance away. Find out more and claim your “FR*EE” copy of New York Get There 1, 2, 3 here. TODAY! Directions: From Times Square MTA 7 or S to Grand Central, 6 to 51st St., walk west 3 blocks to 5th Ave. If you like today's issue, why not become a subscriber to Postcards from New York? To start receiving your own copy visit http://www.postcardsfromnewyork.com/ and enter your email address. Or, forward this to a friend so they can sign-up to receive Postcards from New York too. You can choose to receive Postcards From New York as an e-mail or RSS feed. Click on the small orange button on the right side of the webpage to activate the RSS. Then you will receive new "Postcards" on your email homepage, or enter your email address on the Home Page at www.postcardsfromnewyork.com to receive "Postcards" via email. Be sure to check your email in-box for a confirmation email, then just click where indicated to activate your subscription.